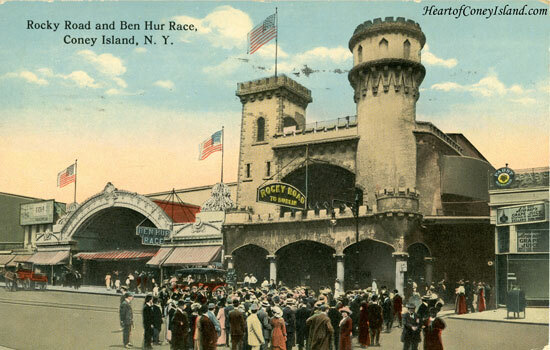 The Rocky Road to Dublin was a large roller coaster located on Surf Avenue, directly across from Dreamland. It replaced the Old Mill in 1906, which itself had replaced Doyle's Annex Hotel in 1902. Doyle's was the original Cable's Hotel dating to 1875, one of the first major structures in Culver Plaza North in West Brighton. 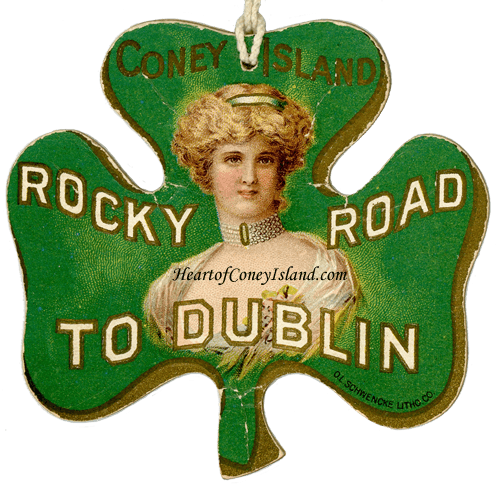 The Rocky Road to Dublin lasted until the early 1920s. The name of this scenic railway was a pretty direct appeal to the Irish immigrants living in New York. It's a reference to an Irish folksong written in the mid-1800s about an Irish lad who decides to make his way from the countryside first to the city of Dublin and then onto Liverpool. The journey isn't a particularly pleasant experience, as when he's actually sober he's both beaten and robbed on separate occasions, all for having an Irish accent. Then again, that's pretty much what it felt like living in the Irish slums of New York every day. 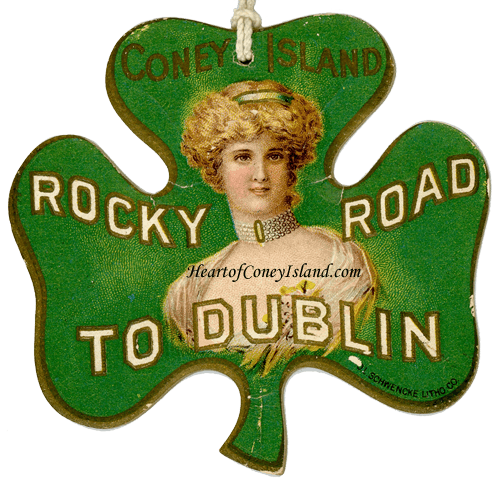 The Rocky Road to Dublin is where Ferrari's lion, Black Prince, ran to in 1911 when Dreamland caught fire. This coaster had several passes with different images, the one pictured below being just one of them. Next time, how about getting an Irishman to print the pass instead of O.L. Schwencke?